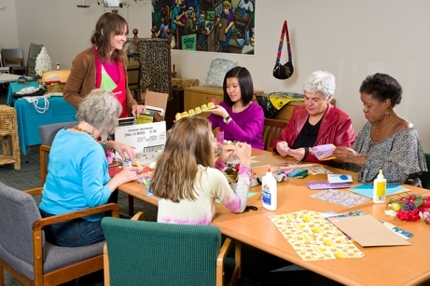 Bring your group to the Reuse Centre for a fun, hands-on learning experience. Programs are available year-round, and can occur outside of store operational hours, but space is limited. Programs must be booked at least 3 weeks in advance. Payment must be made prior to program date. All group programs include a free group shopping experience at the Reuse Centre! It is an excellent opportunity to pick up supplies for your next group project or activity. Fill out our online form to request your group program. Our Programs Coordinator will contact you. Note our pricing has changed as of January 1, 2019. The maximum number of children permitted in a program is 30. The maximum number of people (including adult supervisors) permitted in a program is 40 due to room capacity. Learn how to repurpose and rediscover reusable items, while discovering the fun side of reuse. Become a conscious crafter and explore the basics of upcycling as you create crafts with reusable materials. Plus, learn how reuse benefits the environment and our waste management system, while picking up some DIY tips and tricks! This hands-on program is a perfect introduction into the world of reuse and will inspire participants to start their own reuse projects. Ready for a challenge, waste enthusiasts? Become an eco-agent by completing the Green City Challenge. Test your knowledge of waste and its environmental impacts in this fun and exciting series of mini challenges. Participants will complete hands-on activities on reducing, reusing and recycling waste, while learning how to be more eco-conscious at home and at school.